A juvenile gopher tortoise at the mouth of a burrow on Cumberland Island National Seashore. A JU biology professor and marine science student have gone high-tech on Cumberland Island National Seashore’s gopher tortoise, using GPS mapping along with burrow and remote game cameras to learn about the threatened species’ age, gender, eating patterns, living conditions and even the size and temperature of its burrows. JU’s Dr. John Enz, far right, being interviewed for the “Rock the Park” TV show with show hosts Colton Smith (tan shorts) and Jack Steward (blue shirt) on Cumberland Island National Seashore. 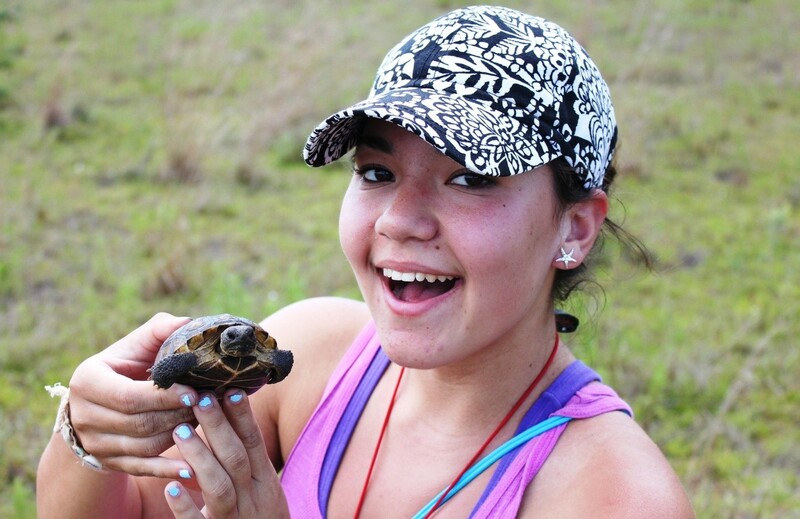 And, while the team is still analyzing the data this semester, preliminary results show more than 400 active burrows on the island, with more than 200 tortoises. JU Marine Science sophomore Alexandria Gagne with a juvenile gopher tortoise on Cumberland Island National Seashore. “The populations also seem to contain all age classes — reproductive adults, juveniles and hatchlings — which indicates a healthy viable population on the island,” Enz said. The syndicated TV program’s production company reached out to Enz to film the work, which led to “a mix of excitement, nervousness, and anxiety.” However, when the film crew arrived, they made the researchers feel at ease, he said. Enz noted that habitat loss, urban sprawl and overexploitation have put the land-dwelling Gopher tortoise (Gopherus polyphemus) on the Threatened species list in much of the southeastern United States. Gopher tortoises are considered a “keystone” species in the Pine Savannah habitats where they like to build their burrows because of the great impact they have on this type of habitat with their burrows, which have been documented as providing shelter for more than 300 species of animals including mice, toads, lizards, frogs, burrowing owls, songbirds, snails, crayfish, numerous insects as well as snakes such as the Eastern Indigo snake, which is itself an endangered species. “Because of gopher tortoise importance to the ecosystems where they are found, it is important to study and learn about the populations wherever it is found in order to properly protect and manage them,” he added. An unstudied population of gopher tortoises exists on Cumberland Island, Georgia, with only anecdotal references to it being found in history books written about the island. Although protected as a National Park, Cumberland Island tortoises have not previously been scientifically studied and documented, Enz said. Therefore gopher tortoise population dynamics such as their number and gender breakdown are relatively unknown other than casual references of them from park visitors and park staff. “These population dynamics data are important in order to know whether the population is, for example, a healthy breeding population that could remain viable for many years to come, or, for example, that the population is just an old adult remnant population left over from when the island was privately owned and brought there, which could lead to their eventual extinction from the island as they die off,” he said. Gathering this baseline information such as current status, distribution, density, and impacts that may affect the became the focus of the research team’s focus. 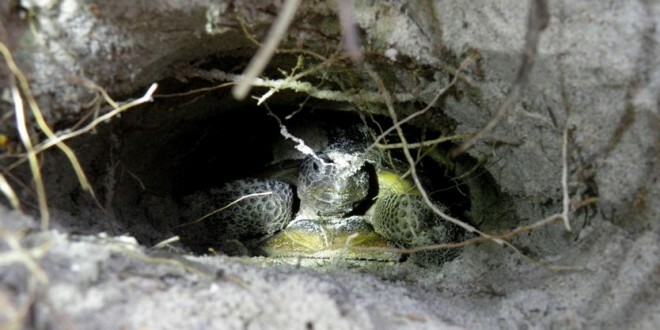 “We used burrow cameras to look inside burrows for tortoise occupancy, and remote game cameras to measure the gopher tortoise population size, activity patterns and other animals’ burrow use on the 40-square-mile island. Additionally, data on burrow depth, dimensions and GPS locations were documented.